Making jewellery comes naturally to little girls which is why this free pattern activity will be a quick and favorite task with your girl. 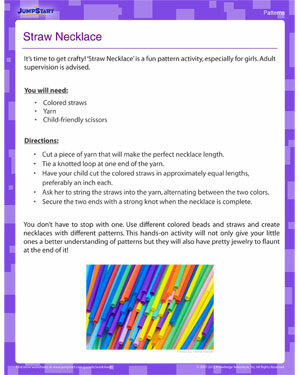 ‘Straw Necklace’ can be done with easily available materials at home. Pattern recognition activities are essential for kindergarten and preschool kids to gradually progress to early math skills. Ensure kids use safe scissors to do this pattern activity and encourage them to think outside the box. Check out other worksheets for 1st grade kids on JumpStart.